The discussion of “architecture of place” is a topic widely focused on in an attempt to promote regionalism and a sense of individuality. Architects that have achieved the level of design that is in sync with the genus loci of a place are celebrated and written about. Mary Ann Schicketanz from Carver + Schicketanz is no exception. Such prowess is visible in the Coastlands House in Big Sur, California, USA. Her firm was commissioned by a retired couple to design their home which was completed in 2012. 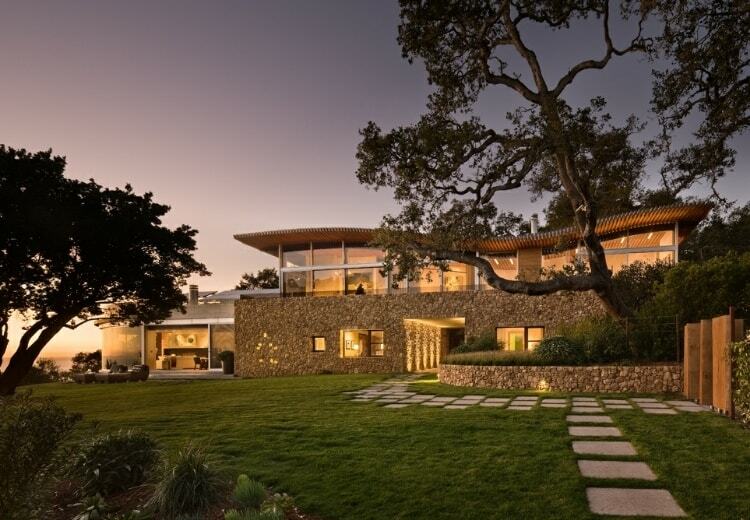 Stone, wood, metal and glass combine to form this palatial coastal residence. This is the one of the welcoming homes that grace the front page cover of house design magazines. A magnificent palette of natural materials come together to form an authentic composition. The transparency of glass makes it blend in so well with the natural materials — it is a space definer that almost appears like it does not exist. The inside spills to the outside and vice versa. The interior is warm, sophisticated and largely comprised of reclaimed materials. The decor was designed specifically for the couple by the Carver + Schicketanz team. To be practical, limiting architecture to contextual influences will create one monotonous street lined with monotonous facades that take away the spontaneity that comes with design. Each city must have an architect as expressive as Frank Gehry, importing structures from Planet Gehry since 1962. Each city must also have a legion of architects who recognize the importance of regional identity and responding to actual site issues. For example, while chasing material sustainability, care must be taken on issues such as how such materials perform as per criteria such as the area’s building code. Whether for building construction or decorative purposes, local resources are often recommended as away of creating architecture that is derived from and gives back to its environment. To digress slightly, there is a common misconception that this kind of architectural language is limited to vernacular architecture. It is assumed that modern architecture only incorporates machine-made materials that are fabricated to appear as if from elsewhere. Some clients take pride in claiming that they imported certain finishes from overseas. It sounds extravagant to boast of marble from India and stucco from Persia. Outcomes of such perceptions result in buildings that have little or less regard to context. Such structures, completely oblivious of the surrounding, often forgo environmental design principles. They create problems and purport to solve them through artificial lighting and HVAC systems. This is why this Coastlands House is a perfect example of modern architecture that pays attention to its location. The sovereign importance of natural light and ventilation in this building cannot be overlooked. The sunshine appeal is not just for vision but for creating a sense of restfulness and well-being. To top it off, an expansive 4.4kW photo-voltaic spread on the rooftop generates roughly 80 percent of the home’s entire energy requirement. Sometimes architects design buildings to be trophy wives — just for show. Little or no regard is paid to the functions of internal spaces and whether or not they are suitable for human comfort and efficiency. Not only does this house cater for thermal comfort but also pays attention to lighting, ventilation and well-suits the luxurious lifestyle to which the client is accustomed. This residence looks like a comfortable well-kept housewife, resting well and blending into the landscape. Its final look after completion appears as if the building came first and then the landscape was carved and molded around it. Nature in all its forms is present and is integrated organically into the architecture.